Remember the Six Million Dollar Man TV series many years ago? That dude was fitted with all sorts of bionic stuff, and he really had it going on with bionic woman. I wonder whether they share oil instead of spit while engaged in some hot tongue action, but I digress. Six million bucks doesn’t really amount up to much these days no thanks to inflation and a rapidly falling dollar – and many people are already decked out in jewelry and other accessories that cost way more than that amount. Still, it would be nice to see humans being fitted with bionic body parts which feel just like the real thing, offering superior athletic performance minus the side effect of steroids. This bionic arm is currently in development at the John Hopkins University courtesy of a contract offered by the Defense Advanced Research Projects Agency (DARPA). As we know, such research will be very costly – which is why DARPA’s Revolutionizing Prosthetics 2009 program has received additional funding apart from the initial amount required. These extra funds will target the most advanced medical and rehabilitative technologies for military personnel injured in the line of duty. 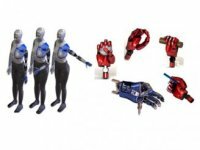 So far, two prototypes were unveiled in Phase 1 where the fully integrated prosthetic arm could be controlled naturally while offering sensory feedback and allowing for eight degrees of freedom. This is already a quantum leap as the level of control provided is beyond that of the current state of the art for prosthetic limbs which have less than half the amount of degrees of freedom of movement. Each Proto 1 limb system also comes with a virtual environment used for patient training, clinical configuration, and to record limb movements and control signals during clinical investigations. As for the second prototype which was unveiled in August last year, it was a vast improvement, featuring 25 individual joints which come close to emulating the natural speed and range of motion of the human limb. I can’t wait for future iterations to be used in real life.